Happy New Year fellow I YUM New Yorkers! 2011 was pretty quiet in the food world for me, but my resolution for this year is to update more regularly and stick to it! Dr. Awesome got me an amazing camera that also films 1080 HD, so I really have no excuse not to use this awesome technology. The camera even has a food setting. Can’t wait to use it! Dr. Awesome’s brother also got us a brew kit for Christmas, which we’ve been wanting. My other resolution is to use my free time more creatively. This means writing more, actually brewing beer, making pickles and other sorts of homemade things that I have time for. Case in point: I just made some pizza dough! Really simple, takes no time to do and I’m going to freeze the extra I have for later use. Done! It’s also about time I posted about our Thanksgiving extravaganza. Yes, I know this is about a month and a half late, but, better late than never. 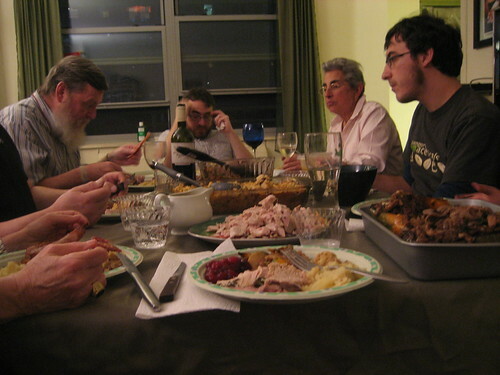 First, I pre-ordered our turkey from Fleisher’s in Park Slope, Brooklyn. We opted to go all-out this year and make sure we got a turkey that was raised well and knew where it came from. This big 16 pound guy came from a farm Fleisher’s became friends with in California. It was also a Heritage turkey. What’s a Heritage turkey? They’re a breed that’s closer to what turkeys back in the day used to be. What I loved about this turkey (though really expensive) was that it didn’t have a huge breast, like how turkeys today are bred. This guy had HUGE legs. He was the tastiest turkey I have ever had, and everyone else agreed. Here’s some more info about the breed: Heritage Turkey Foundation. 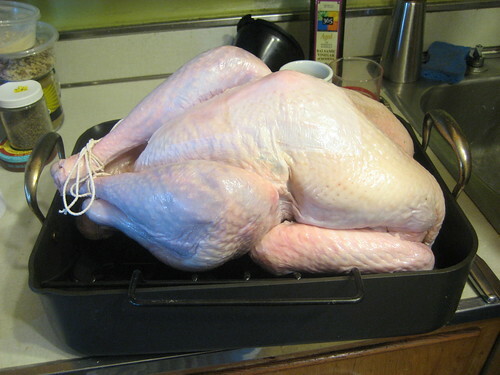 With the help of Dr. Awesome’s mom, we brined the turkey in the sink for a bit to make the meat a bit more tender. 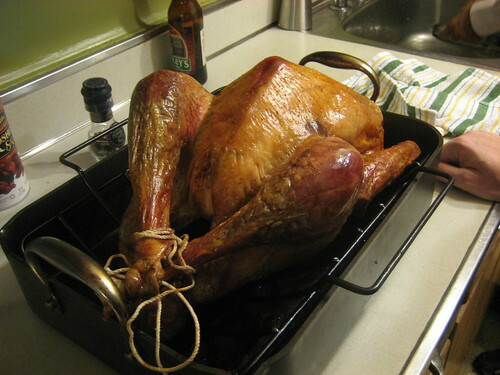 We then trussed it and put it in the roast pan. You can see how much smaller the breast is on this guy than on the what we see in your usual supermarket. 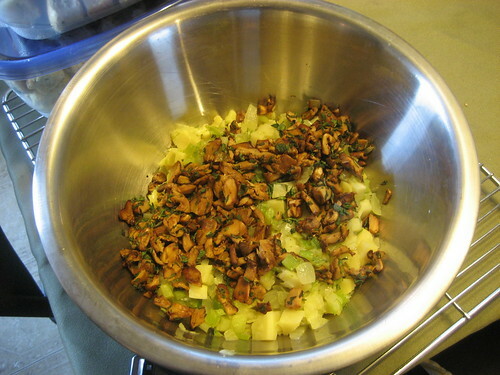 Here’s some of my stuffing mixture. There are parsnips, onions, celery and chantrelle mushrooms in that bowl. 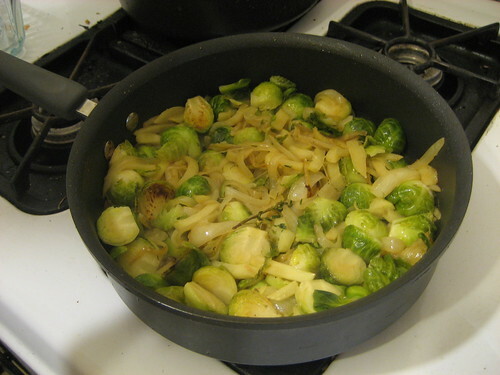 This was our brussel sprout recipe (thanks to the Voltaggio brothers; we used a lot of their recipes). We didn’t add any butter or bacon cause we had a vegan guest with us. There’s onion and granny smith apples in the pan. Our antipasti platter, thanks to Di Palo’s. 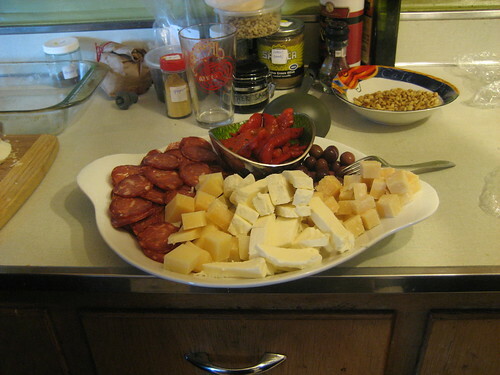 Can never go wrong with cured meats and cheese as an appetizer! And hello awesome turkey! It was the best turkey we’ve cooked to-date too. As you can see, there was a TON of food. Dr. Awesome’s brother and girlfriend made a vegan stuffed squash that had cumin-flavored risotto which was really good, a cranberry compote (Voltaggio), chive and biscuit stuffing (Voltaggio) and for dessert, apple and praline peach pies from the Berkshires. So what did we do with the leftovers? 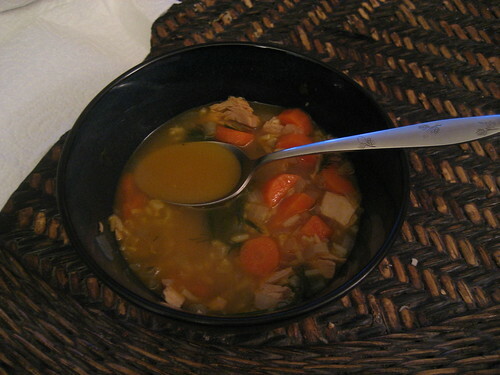 Made some turkey soup! We had some vegetable stock leftover along with the turkey. I bought some carrots and dill, and used the rest of the leftover onions. Sweated them down, added some chopped up turkey, then the stock with some dill and bay leaf. 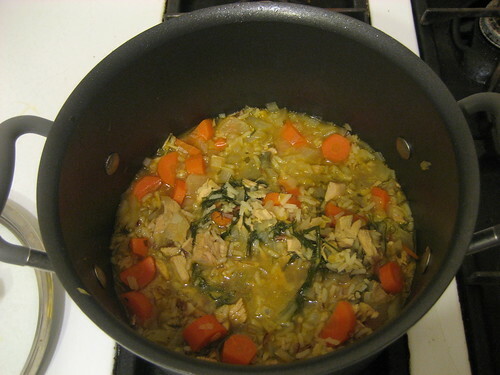 Added about 1/2 cup of rice and let it go till it all meshed together. I could go for a cup of that now since the temperatures finally dropped. The next few posts are going to be of my adventures in San Francisco. I’m going to break them up into separate days since I did a lot the whole week there. Again, I hope everyone had a great new year and holiday! Here’s to a great 2012! ~ by Rori on January 3, 2012. All looks great but the Turkey is truly a masterpiece! Great job girlfriend! Thanks, Ginger! You’ll have to be there to cook it with us next time! Great stories and Pics Rori!! Brings back lots of great memories, though S.F. was some time ago.